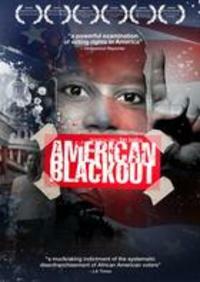 American Blackout chronicles the recurring patterns of voter disenfranchisement from Florida 2000 to Ohio 2004 while following the story of Georgia Congresswoman Cynthia McKinney. McKinney not only took an active role investigating these election debacles, but has found herself in the middle of her own after publicly questioning the Bush Administration about the 9/11 terrorist attacks. Featuring: Congressional members: John Conyers, John Lewis, Stephanie Tubbs-Jones, Bernie Sanders and jounalists Greg Palast and Bob Fitrakis. HOSTED BY: Historic Harlem Parks.